IBSAT 2019: IBSAT is a University Level entrance exam organized every year by the ICFAI Foundation, Hyderabad. IBSAT is organized to provide admission to MBA and PGDM programs into IBS affiliated campuses located at Jaipur, Kolkata, Mumbai, Pune, Ahmedabad, Bengaluru, Gurgaon, and Dehradun. Latest Update 12 Dec: Application form Submission Last date is 12 December (Today)!! Follow the Application Form Link to Fill the Form. Latest Update: IBSAT Application Filling and Submission Starts from Today (1st July)!! Check Full Schedule below. Update: IBSAT 2019 Schedule announced… Check the Table Below. 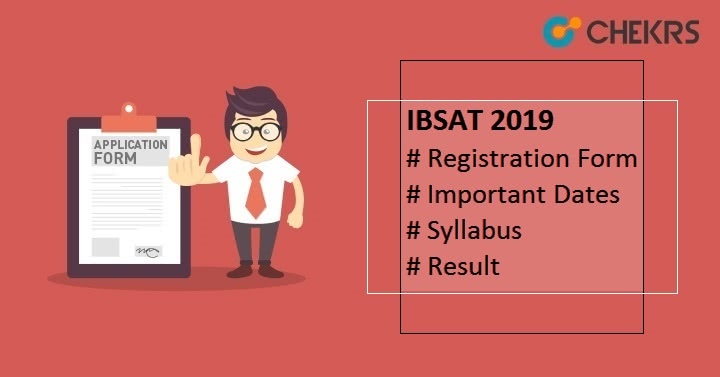 IBSAT 2019 Registration started on 1st July 2018. So the candidate can apply for it now. Last date to access application form is 12th December 2018. In this article, we are providing all the details regarding the IBSAT 2019 Exam. The IBSAT Exam Dates has been already announced on the official website. Candidates can check the tentative dates in the table given below. To fill the form and appear in the exam candidates have to fulfill all the eligibility criteria prescribed in the official notification. Here, we have listed some of the IBSAT Eligibility Criteria. Complete the graduation in any discipline with the medium of instruction as English. All the Candidates without English medium in graduation have to submit the TOEFL/NELT/IELTS score by 31st May 2019. Candidates must have completed a minimum of 15 years of education under 10+2+3 or 10+2+4 basis scheme. Candidates must have to obtain at least 50% marks and above in the qualifying examination. Appearing Candidates of final year/semester are also eligible to apply. Registration can be done in Both Modes i.e. Online & Offline. IBSAT 2019 Registration started on 1st July 2018. So the candidate can apply for it now. The last date to access application form is 12th December 2018. In Offline mode, the form can be purchased from the marketing offices of IBS by paying the application fee. In Online mode, Candidates can fill the application form by going through the official registration site. IBSAT Application Fee: The IBSAT Application Fee is Rs. 1800/- . Payment can be done through credit card, Debit card, or Net Banking. Candidates also have to do IBSAT Slot Booking for the examination. Slot booking process will be done with and in the Application form. Candidates have to select time and exam center for the examination of the available options. Candidates are advised to select a maximum number of allowed options. After filling the application form candidate will search for the Exam related content to start preparations. So for your help, we are also Providing IBSAT Exam Pattern. The IBSAT Syllabus will comprise questions from subjects like Quantitative Techniques, Data Interpretation, Data Adequacy, Vocabulary, Analytical Reasoning and Reading Comprehension. Weightage in these subjects are listed below. IBSAT Admit card will be released online on the official website. Candidates need to go to the official website to access and download the IBSAT Hall Ticket. Hall ticket will be also required at the examination center for candidate verification. So make sure to carry the admit card with a photo id to the examination center to make thing easy for yourself on that special day. Applicants have to practice IBSAT Previous Year Question Paper to get used to the pattern and timing. Follow the best and useful book which is relevant for the exam. Take care of your health and manage your time. The Result will be declared online on the official website. All the candidates who appeared in the examination have to enter asked details to access their IBSAT 2019 Result. After the result declaration candidates will be informed about it. Candidates have to visit the official website and they have to find the result link there. After result declaration candidates will be shortlisted on the basis of their result. Shortlisted candidates will be called for various admission procedures. IBSAT who cleared the IBSAT 2019/GMAT/CAT/NMAT exams will be called for the selection procedure/ Admission at IBS Hyderabad from 20th February 2019. The IBSAT Selection Procedure will consist of GD and PI Round. Their documents will be also verified there. The List of Documents which are required for the verification is given below. The final IBSAT Admission 2019 will be done on the basis of Scorecard, Performance in GD and PI, Academic records and document verification.